Through the support of our sponsor, Vizient Inc., the American Fallen Soldiers Project honored the family of Fallen Army SPC Dane Balcon with the presentation of an original portrait by artist, Phil Taylor. The presentation, which honored Dane’s service and shared his story, took place in Las Vegas, Nevada on October 4th during the closing session of Vizient’s 2018 Connections Summit. 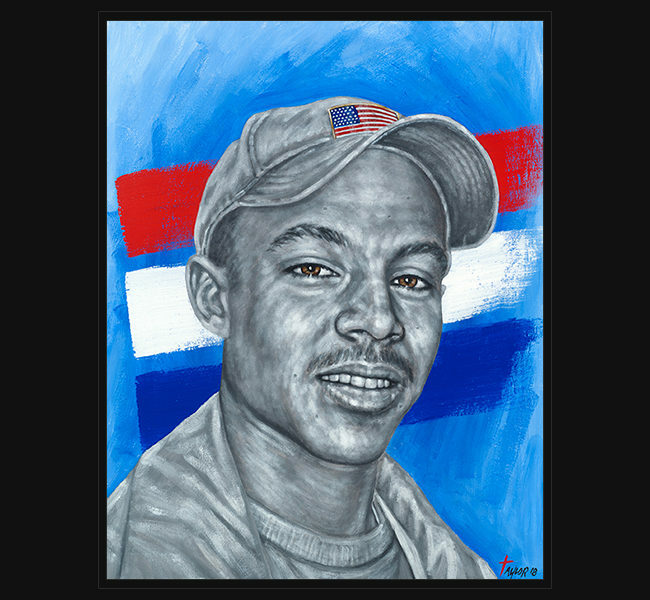 Vizient annually sponsors the presentation of a portrait to help honor the bravery and sacrifice of a Fallen military member. “When you think you understand the notion of courage and sacrifice, hear the story of Specialist Balcon. He was just three years old when he told his mom he wanted to be a soldier. He enlisted when he graduated from high school to fulfill his dream of serving his country. When he learned of the delay in his first deployment overseas, his thoughts went to those soldiers who were now also delayed in coming home to see their families. It is an honor and privilege to recognize a great American, a hero and a truly courageous young man,” said Rand Ballard, chief customer officer for Vizient. Army SPC Dane Balcon was assigned to the 1st Squadron, 7th Cavalry Regiment, 3rd Brigade Combat Team, 1st Cavalry Division from Fort Hood, Texas and was deployed in support of Operation Iraqi Freedom at the time of his death. The 19 year-old was killed in action on September 5, 2007 along with one other soldier by a roadside bomb.